Pakistan is an agricultural country spreading over an area of about 79. 6 million hectares (Mha) with an arid and semi arid climate. Of 79. 6 Mha, about 23 Mha is suitable for crop production and nearly 25 percent of the total cultivated area is designated for rainfed agriculture. Unfortunately, rain-fed agriculture is constrained with multifarious problems such as moisture stress, soil erosion and crusting, nutrient deficiency, depletion and poor nutrient use efficiency, and weed infestation limiting the yield potential of these lands. In addition, deforestation and poor crop husbandry techniques are commonly noticed features. To meet the food requirements, farmers bring all the available pieces of lands under plough including steep slopes. Farming on steep slopes if not managed on scientific lines, results in severe erosion. The problems faced by the farmers are due to the unsustainable practices they adopt to practice dryland agriculture, limiting the productive potential of these important ecosystems. However, their potential can be improved by adopting suitable rainwater harvesting techniques; employing scientific soil and water conservation methods and using sustainable agricultural practices. 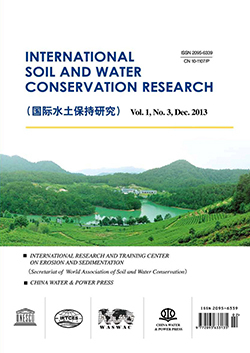 This paper highlights some important issues associated with the rainfed agriculture of Pakistan. Working strategies for realizing optimum and sustainable yields have been outlined while conserving both land and water resources. Baig, M. B., Shahid, S. A., Straquadine, G. S.